This perennial bush-like plant with small green leaves bears small pink flowers in May. This greyish subshrub covers poor, dry scrubland and wasteland with a grey mantle. 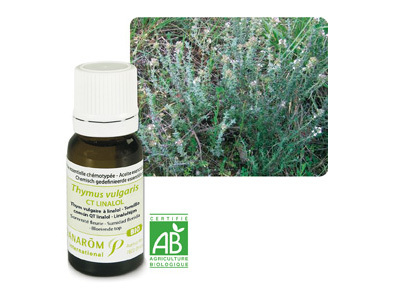 Thyme CT thujanol provides an essential oil of extraordinary quality because of its powerful action, good tolerance, and the characteristics of its chemical race. This major essential oil should always be in the medicine cabinet of all informed users. major antibacterial • powerful antiviral • immune stimulant • hepatocyte regenerator and tonic • warming blood activator • nervous harmoniser and neurotonic • fungicide. - Unless medical or pharmaceutical advice, not to use during the pregnancy and breast feeding and in the child of less than 3 years. External : 3 to 4 drops 3 x a day along the spine and/or solar plexus. Recommended for the child, because the chemo types of phenol thyme would be too aggressive, this CTEO is a good alternative to favorize the respiration.